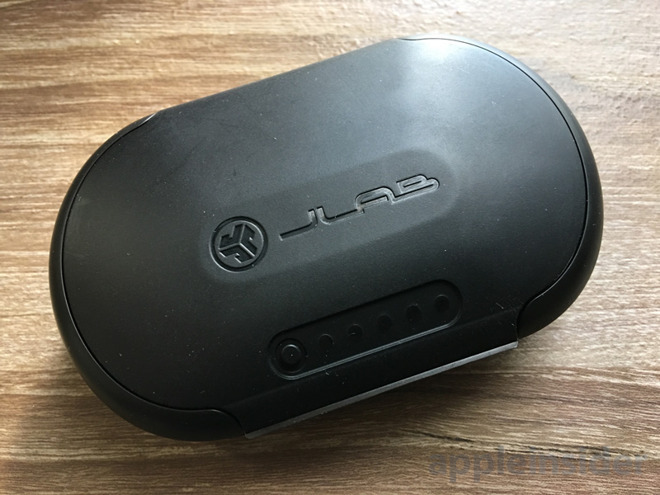 JLab's Epic Air Elite is an affordable, quality pair of wireless sports earbuds, possibly even preferable to Apple's AirPods — yet it still faces superior competition. Two things have always bothered me about (most) fully wireless earbuds: fit and durability. I have a hard time finding any earbuds with a tight seal, never mind worrying about whether a bud will fall out completely. The durability problem is mostly workout-related — I typically spend about 2 hours at the gym each session, and I know firsthand how sweat can break buds that don't have some degree of water resistance. The Epic Air Elite addresses both of these issues. The buds offer IP55 water resistance, which is enough to protect against sweat, even if I wouldn't take them in a shower or pool. AirPods aren't IP-rated at all. For a secure fit JLab offers integrated earhooks and seven sets of tips, coming in various shapes, sizes, materials. There's a pair of blue foam tips for example, and double- and triple-flanged silicone ones can reach deeper into the ear and/or prevent slip-outs. Some people aren't fans of hooks, but in my experience they're a godsend simply because they're more reliable than fins. Even if a bud comes loose in your ear hooks keep them from tumbling out — if a fin comes loose, you'll be hunting for your bud on the floor. The sheer number of tips JLab includes is welcome, since most people should be able to find a set that matches their ear shape and comfort level. I had trouble, personally — I had to test several sets before I found one I liked, and even then the seal wasn't tight enough to deliver maximum bass. Jaybird's Tarah Pro and Apple's Powerbeats3 seem to deliver a better seal with more bass, even versus the Elite's "Bass Boost" EQ setting. There are two other hardwired EQ modes, "JLab Signature"and "Balanced." People who listen to rock or podcasts during workouts may prefer Signature over Bass Boost, but Balanced is so flat that it can safely be skipped. One nice touch is JLab's optional "Be Aware" mode, which mixes and amplifies ambient noise so you're aware of your surroundings — especially important when you're riding a bike, board, or scooter. I ended up leaving this off most of the time because it works so well as to be distracting. I also found the buds' touch commands hard to remember, however. Different commands require you to tap in varying lengths and amounts, and often on one specific bud. Be Aware requires a triple-tap for example, and you have to double-tap on the left bud to play and pause. Double-tapping on the right bud triggers Siri. As a result I frequently found it faster to use my Apple Watch to control audio. In fact touch sensitivity caused problems, since I would sometimes accidentally change volume when trying to readjust my fit. Even if it could use more bass, I did find the Elite's audio clear and pleasing overall. It won't wow anyone, but for the price, it may do the trick. Next to gym-readiness the Elite's best feature is battery life. The buds can run for up to 6 hours on their own, above the 5 provided by AirPods. Its charging case offers an extra 32 hours versus Apple's sub-24, meaning you that if you work out six hours per week like me, you can easily go over a month between charges. In an office the product could last a full work week so long as you charge the case during lunch breaks. My only complaints about the case are that it's relatively bulky, and that it uses a flat, USB-A-to-micro-USB charging cable meant to wrap around the sides. The cable resists bending into other shapes, and it's tricky to clip back in place, so I typically just left it plugged into my computer. In a pinch though the case can be used to charge your iPhone, since it has USB-A output. The Epic Air Elite is a fundamentally sound product, no pun intended. 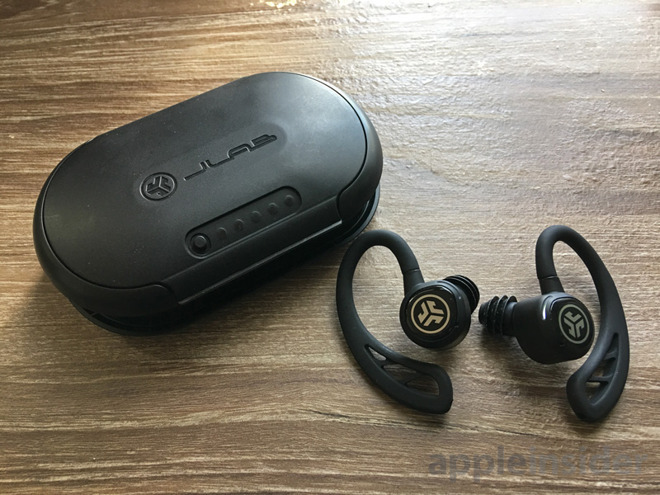 If workouts and battery life are paramount, put these on your shortlist and forget about AirPods. That being said, there are better sports headphones. My first choice would be the Tarah Pro, which is only about $11 more expensive. Jabra's Elite Active 65t doesn't have as much battery life, but comes equipped with physical buttons and should sound better to boot. If you want hooks there's the Plantronics BackBeat Fit 2100 or the Powerbeats3, which also has Apple's simplified pairing technology. JLab Audio's Epic Air Elite wireless sport earbuds are on sale for $119.99 at Best Buy, or on backorder for MSRP at Amazon.